The elegance of sapphires and diamonds set amid classic quatrefoils and sweeping garlands. A perfect marriage of classic and modern design. Created by Strobell & Crane in 14kt white and yellow gold, circa 1920. The cufflinks are beautifully crafted with sturdy cross bars and strong four-footed brackets. The yellow gold backs are polished to a mirror-like finish (please excuse the dark reflections from my camera). 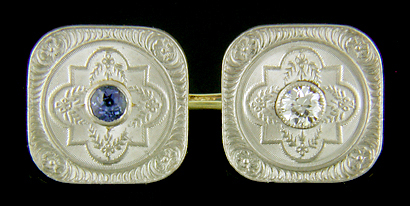 The cross bars are stamped with maker's and gold purity marks. "S14C" is the maker's mark of Strobell & Crane, makers of fine gold cufflinks and other jewels during the early decades of the last century. 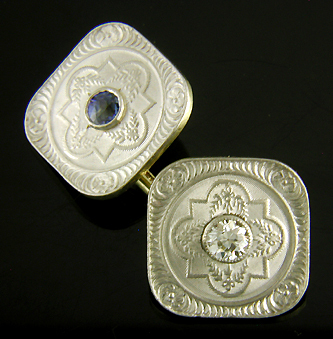 Cost: Although this elegant pair of cufflinks has sold, you will find many more fine cufflinks in the Antique Cufflink Gallery. 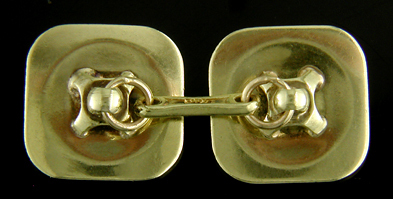 Measurements: These 14kt white and yellow gold cufflinks weigh 11.1 grams and measure 9/16" along each side.